« Tell Us About Your Blog (or somebody else’s)! 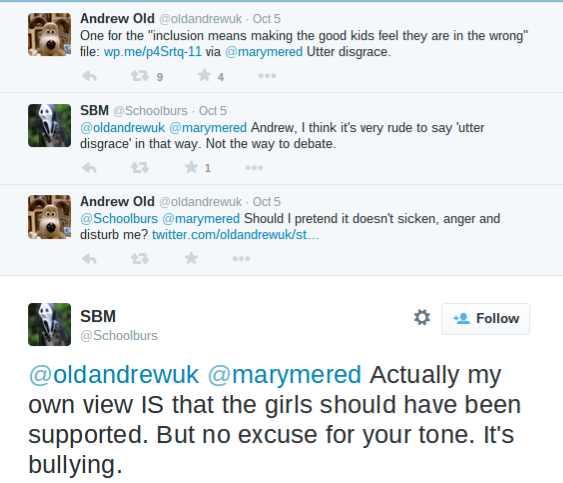 I have talked recently (see “Witch-hunt“) about personal attacks and bad arguments. It dawned on me that I am often subject to two contradictory attacks. The first is that, by suggesting we listen to reason, look at evidence or attend to matters of factual accuracy, I am ignoring the emotional side of things. In effect, that I am a desiccated calculating machine, dryly weighing everything up without any feeling for what’s at stake. However, at the same time, whenever I have referred to, say, feeling angry about children’s behaviour or disgusted at somebody’s unwise actions, I get attacked for hostility, intimidation or hatred. I used to get this sort of thing all the time. Now it’s more often aimed at new bloggers, like “Quirky Teacher”. An example of me showing empathy and emotion. Went down really well, as you can see. What has gradually occurred to me is that this sort of thing is reminiscent of the “bisected teacher” phenomena that I described here. Those who sit in judgement will condemn teachers both for their feelings and their lack of feelings. This is because it is not emotion, or its lack, that is actually at issue. It is a willingness to comply only with the approved display of emotions. It is not about emotion, but about emotional correctness. It is the right sort of show of concern, not the genuine feeling of concern. Genuine emotions are, by contrast, messy and sometimes difficult to deal with. And often these are to be condemned. Being honest to them, particularly regarding the consequences of their actions and the effect they are having on others. Refusing to let them know how they are doing relative to each other or to where they should be. Perhaps, I am being overly harsh with some of those items. But I do often think that there is an image in our heads of what a teacher should be like that is closer to being the biggest, most popular, kid in the class rather than an expert advocate of our students’ true interests. I think it takes real guts and determination these days to think about the happiness of the future potential adult stood in front of you, rather than the child who would naturally seek an easy life right this minute in time. We risk being seen as insensitive, cruel even. I think those who placate and think about putting the child’s wants first are playing a cruel trick upon that child, a trick that the child may never realise until way too late. This is the dividing line: those who seek to placate vs those who can steel themselves and do the right, adult thing. We are in loco parentis, after all. Step (1) Retweet a blog you think is rubbish (someone’s hard work & opinions) with comment -“One for Such and Such Pile” (sad attempt at humiliation) over and above responding politely asking questions and debating rationally. Step (2) Await their defence. Step (4) If gets really serious, write further blog accusing of “witch hunt” over and above, people responding to your initial antagonistic approach. Step (5) Then, write further blog “I can not win blog” – Happy days !!! Step (6) Take an arrogance check. Step (7) Write blog describing “authentic concern” v “emotional correctness” summing up your “either or” approach and lack of flexibility where education is concerned. Over and above, the real world, where, thankfully, most teachers realise that children are individuals and different handling is required. Num 5 is a classic – Making lessons entertaining!! God forbid that should happen I am 47, my history teacher, years ago, well before “progressive” was known as a term – was resolute in making lessons entertaining !! You quote this in the category of “all either empty of potentially harmful” !! Step(8) Learn from the previous generation. People forget that I follow 900 blogs. Most I do nothing about. Several hundred are reblogged on the Echo Chamber. Some are RTed. Some are worth RTing for what’s wrong with them. I’ve tried different ways to do this. When it was done without flippancy and with an explanation, I’d get attacked for pompousness. When it was done with a “for pity’s sake” and no reason I’d get attacked for not saying what the issue is. The “file” approach is the easiest way to give a reason in 140 characters and had led to interesting debates with those interested in debate, and attacks on my style from people who always attacked my style. Again, you say this as if ad hominems and objections to tone are something that I have seized upon unusually. They are actually the standard bad arguments of internet debate. To single me out for spotting them is like singling out an A-level maths teacher for spotting mistakes with negative signs. Pointing it out is a result of them being common and wrong, not some strange behaviour on the part of the person pointing it out. It is popular, well-used, and nothing anyone can object to, unless they want to defend bad arguments. Has anyone actually read the blog about witch-hunts? The whole point was that it wasn’t about an argument that got out of hand. Most of the people targeted were not part of any debate, they just expressed the wrong opinions and had dozens of people discussing how terrible they were with no opportunity to respond. I suggest you read the blog above properly. I started with the contradictory nature of personal attacks on me, but that’s not actually what it is about. Oh sorry, you wanted me to overlook your bad argument, didn’t you? Why was that again? Because you didn’t understand why it was bad? Because I often point out that sort of bad argument? Tough. 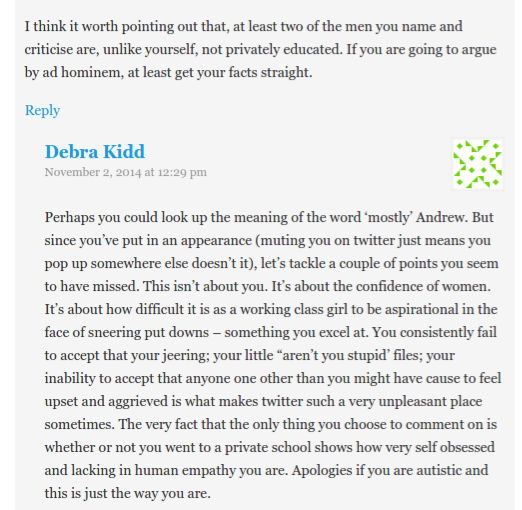 You bring the ad hominem in place of a real argument the least you can do is put up with having it pointed out. Are these steps actually meant to describe a pattern of behaviour? Or is it simply listing things you object to but have little argument against? And, of course, kids need different treatment, but the points above are about how teachers are expected to behave in general. It’s been around since the nineteenth century. Became most popular here in 1967 with the publication of the Plowden Report. Yep. Lessons which entertain rather than educate do a lot of harm. And that’s something that has long been appreciated, but became a big issue lately with all the talk of “engagement”. As you know I’m a long time fan of your blog and I’ve been pleased to meet you on a couple of occasions. Take it from a friend, please, that your more recent blog posts are not presenting you in your best light. Despite what it seems when one wires oneself into Twitter, the whole world doesn’t actually revolve around it and you only give your critics wider attention than they deserve when you post about their antics. If they’re offending you, block them. You’ve been around long enough to know that feeding trolls is a Bad Idea. This one wasn’t meant to be about Twitter debate. Perhaps I harped on about it for too long for that to be clear. I am concerned that now my anonymity limits my freedom to lead into topics from examples at work, I’ll overuse Twitter debate as a way to lead in to a topic. I didn’t think this one did that (far more worried about the “witchhunt” one where the link to the wider debate was, perhaps, too tenuous), but will probably be steering away from that kind of introduction in the future.